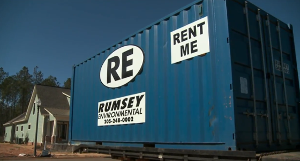 Rumsey Environmental provides storage container rentals with professional service. We have an inventory of quality industrial steel containers for equipment and tool storage or other storage needs. Our experienced drivers will deliver the storage container to your construction job site, work site, business or residence. Enter your information to learn more about storage container rentals in your area. I am already a Rumsey Environmental customer.